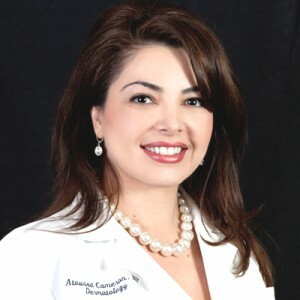 Atoussa holds dual certification (AANP and ANCC) and her education together with years of experience allow her to provide excellent patient care in both areas of clinical and cosmetic dermatology. In addition to seeing Dermatology patients, she also enjoys being in the operating room and assisting Dr. Klein and Kassardjian during liposuction surgeries. Atoussa also helps with skin cancer screening, biopsies, excisions, acne, wart treatments, lasers (hair removal, vascular lesion, Fractional), thermage, botox, and fillers such as Juvederm, and Restylane. She also coordinates the Klein Tumescent Liposuction Course (TLC) which is a 3-day hands-on program for surgeons. During the course, Atoussa teaches course participants about Tumescent Anesthesia and provides them with hands-on experience to learn the technique. Meeting Atoussa, it is apparent that she truly enjoys her job, cares deeply about the quality of work she delivers and treats all her patients with the respect and high standards of care that they deserve.